With thousands of stupas and payas to visit, there is no single optimal itinerary for seeing Bagan's collection of temples. The temples in this list are recognized to be Bagan's biggest, most scenic, and most popular, and should definitely be included in any Bagan temple-hopping itinerary lasting more than a day. For half-day temple runs, my guide Aung Kyaw Moe says you stick with two stops: "For a half-day trip, you visit Shwezigon and Ananda temples," says Mr. Aung. "If you have already been to these two places, it's OK." For longer tours, arrange your temple jaunts around the spots listed here. Just a few words of advice: for two of these temples (Htilominlo and Shwesandaw), local inspectors will certainly check if you're holding a valid Bagan temple pass; random checks might also take place elsewhere. And if you're planning to see all six in a single day, choose a Bagan transportation option that gets you around the fastest (car with driver, yes; horsecart, hell no). To get a grip on Myanmar temples' hidden language, read our little temple cheat sheet. 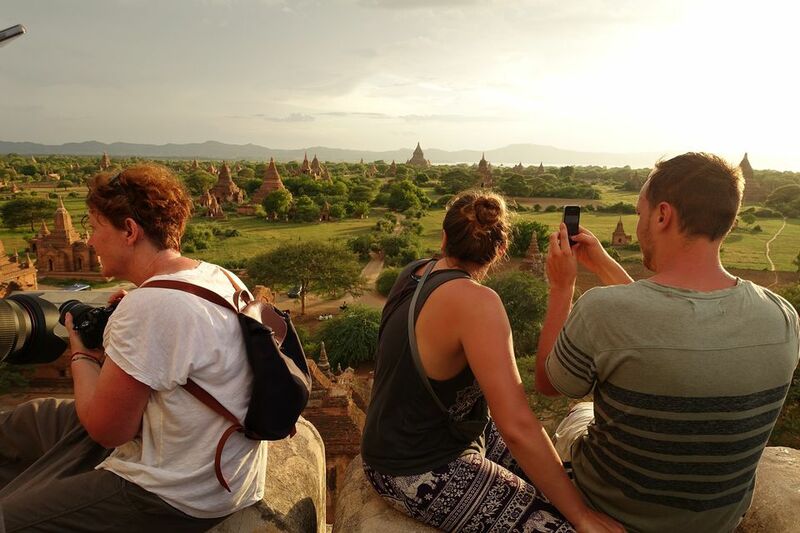 For an alternative temple itinerary, check out this list of Bagan temples with a sunset view. Shwezigon's similarity to Shwedagon in Yangon further south is no coincidence. After Shwezigon was completed in 1086 AD, the symmetry and beauty of the temple served as a model for many other temples built throughout the empire. Shwedagon – the upstart completed four hundred years later – may have exceeded its inspiration in size and beauty, but bears its predecessor's influences nonetheless. Ordered by the great founding king Anawrahta and completed by his successor Kyansittha, Shwezigon's design reflects the influence of both generations. Similar to Shwedagon further south, Shwezigon served as a consecrated ground where kings could pray for, or give thanks for, success: the southwestern corner was reserved for such prayers. The temple's name reflects this purpose: "Shwe means golden, zigo means ground or victory," my guide Mr. Aung explained. "If the king had an important matter, they stood there to pray what they want to do – their wishes will be fulfilled." Around a massive 160-foot-high golden spire, you'll find a series of other pavilions that serve both sacramental and educational purposes. A pavilion shows dioramas of the Buddha's first encounter with the Four Sights; another features a series of alms bowls arranged in a ring, where you can try to shoot money into a bowl. King Htilominlo (reigned 1211 to 1235AD), the youngest of five princely sons to King Sithu II, secured his reign by dint of a superstitious ceremony, where the King's umbrella fell to point in his direction. The name of both King and Temple reflect the event – "hti" (umbrella), "min" (king), and "lo" (wonderful desire) put together implies that the umbrella chose the prince to be the next king. The temple is not the biggest in Bagan, but it surely counts as one of its most beautiful. Its spire rises 150 feet over the Bagan countryside, while each of the four sides facing the cardinal directions measuring roughly 140 feet across. A perimeter wall surrounding Htilominlo Temple bustles with market stalls selling artwork, clothes and assorted souvenirs, giving the temple courtyard a market-like atmosphere. Red bricks make up both wall and temple structure: most of the brick is exposed, revealing an alternating horizontal and vertical brickwork with very little mortar in between. The temple's interior reveals four gilded Buddha figures facing each of the cardinal directions. The chambers are connected by hallways lined with frescoes depicting Buddha's life and times. The Ananda Temple is a cathedral-like structure with few equals in grandeur and spiritual stature in Bagan. King Kyansittha – son of Anawrahta and the patron behind the completion of Shwezigon – ordered the construction of Ananda Temple, which was completed by 1105AD. The loftiness and perfection of Ananda's form gave rise to a few dark stories. First, Ananda was rumored to have had the architect-monks of Ananda killed after the temple's completion, to ensure no other perfect temple could follow in Ananda's wake. Second, Kyansittha was intent on having himself buried alive in Ananda's relic chamber, only relenting after being scolded by his chief monk Shin Arahan. "If you want to build a temple as a sacred place, don't enshrine yourself!" Mr. Aung imagines Shin Arahan admonishing his king. "If you do, it will not be a temple, it will be a tomb." The floor plan of Ananda resembles a Greek cross, with hallways that reach out to the four cardinal directions, emanating from a hall bearing one of four Buddhas, standing about nine feet tall and made from gilded wood. The halls are connected by a unique set of two hallways: an interior tunnel reserved for the royal family's use, and the exterior for the use of monks and other devotees. Despite the heavy stone and brick that makes up Ananda Temple's structure, the design ingeniously manages to feel well-ventilated and well-lit: vents connecting the hallways to the exterior permit wind and light to circulate in Ananda Temple, keeping the interior pleasant despite the flood of warm-bodied tourists coursing through the hallways. Bagan's most massive temple was constructed by the tyrant Narathu, who came to the throne by killing his father Alaungsithu, and was later assassinated himself. During his short reign between 1167 and 1171AD, Narathu attempted to avert karma by constructing the tallest temple in all of Bagan. Dhammayangyi is unique for its pyramidal shape, the only such temple in all of Myanmar; the brickwork reflects the impossibly high standards that Narathu set for the artisans who raised it. "Narathu wanted Dhammayangyi to be higher than the highest temple, better than the masterpiece [Ananda Temple]," Mr. Aung explained. "That's why he commanded the masons to lay their bricks very close. The supervisor would check with a needle – if it was possible to insert with a needle, the masons would be killed." Such bloodthirstiness eventually brought his reign full circle, a mere four years into his reign. After killing his Sri Lankan queen in a fit of rage, Narathu himself was assassinated by killers sent by his outraged father-in-law. When he perished, Dhammayangyi was incomplete – and would remain that way ever since. "There's no special decoration inside Dhammayangyi; just many bats, the smell inside is very pungent," Mr. Aung tells me. "Even the local people they dare not to cross across after sunset – they think the temple is haunted. Named after the exiled Mon king who built it, Manuha contains four giant Buddha images, three in front and one reclining in the back. Unique among Bagan's temples, Manuha was built by a conquered king living in exile. King Manuha, whose Thaton Kingdom south of Bagan was conquered by the great king Anawrahta in the 11th century, lived his last years under house arrest in Bagan. He sold a ruby ring to raise the funds necessary to erect the temple that now bears his name: a long, four-chambered temple that contains three sitting Buddha images facing east, and a single reclining Buddha image facing west with head facing north. The three east-facing Buddha images stand in cramped quarters with ceilings barely higher than the images' heads (the middle Buddha rises 46 feet high, while the flanking Buddhas stand 33 feet high). Locals believe that the Buddhas were built to reflect King Manuha's inner anguish: one sitting Buddha has "unhappy eyes and lips", as my guide explains, and another has a swelled chest that indicates the anger Manuha kept inside his heart. The 90-foot-long reclining Buddha image in the rear depicts Buddha on his death bed, an aid to meditating on the nature of existence, Mr. Aung explained - "Even the Buddha, he had to die one day," he told me. "No special favors – if there is a birth, there will be a death. If we have done enough good deeds, and if we have already practiced the right meditation, we will not be afraid of death. Shwesandaw is one of only five terraced temples that visitors are permitted to climb (the others are Thitsa Wadi, South and North Guni, and Pyathatgyi), but the views from its five concentric terraces are arguably the best you'll find around Bagan. Steep stairs lead up from the base to the upper terraces; a steel bannister provides some leverage for climbers with less than sure steps. From the base to the hti at the top, Shwesandaw measures 328 feet; at the upper terraces between 200-300 feet in the air, travelers take in the views of the Ayeyarwady River in the far distance, along with buildings in closer proximity, among them Thatbyinnyu Temple (can't miss it, this is Bagan's tallest temple) and the Bagan Archaeological Museum. The 1975 earthquake that devastated Bagan also left its mark on Shwesandaw: the hti you see at the very top is a replica of another that was toppled during the tremors (the original is now housed safely in the Archaeological Museum). The temple is also missing hundreds ot clay reliefs bearing images from the Jataka Tales. Shwesandaw is open all year round, but for the best all-around views, go during Bagan's winter season between November and February, when the sky is clear and the visibility is at its best and brightest. You should also time your visit to coincide with either sunrise or sunset, when the sun makes the brick surfaces of the nearby temples glow a rich, mellow orange.